The instrument photographed inside the spaceship is not an unfamiliar instrument to the earthlings, but indeed an oscilloscope which is still used for certain purposes in the ancient spaceship. I don’t know what it is used for however, because normally I’m not interested in technical and mechanical issues etc. I know that we are dealing with an oscilloscope here, because friends requested me to ask about it. I never asserted anything else, and thus I don’t have to retort nor justify myself in this case. There are 3 main reasons why Meier’s excuse, probably given for the first time in 1996, doesn’t actually fly. 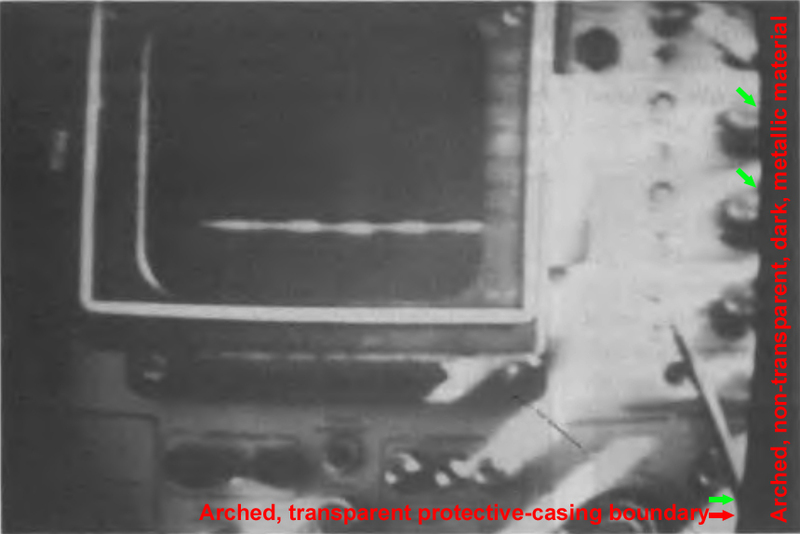 Meier’s explanation that he had never portrayed the concerned object in the photograph as anything other than a terrestrial oscilloscope is most probably a lie. As evidence, we have Meier’s own (ex-) FIGU group member Herbert Runkel (from Munich, Germany) who apparently has been presenting this image, allegedly photographed by Meier on July 17, 1975, during his lectures in 1970’s and 1980’s as “an extraterrestrial instrument on the inside of a spaceship”. The flight to Venus doesn’t take very long, so I have just enough time to examine in more detail the equipment for making the photos: the viewing screen3 looks to me like clear glass, through which everything outside can be observed. I only notice that this whole viewing screen has a very fine resolution, similar to a photographic print. The size of the screen is about 50 x 50 cm (~20″) while the color-radiation device is installed on the side of it and recessed, so I could not examine its inner workings. Beside this device there are many different kinds of apparatuses all around the cockpit room, installed within a circular control console and on the walls. All this strange-looking equipment, already seen on the first flight, is obviously used for the guidance and control of the beamship, while also serving as exploration devices, distance meters, radiation control devices, and other such things, all playing important roles in the operation of the flight machine. All the display screens basically differ from all other apparatuses of the same kind and terrestrial origin that are known to me. All the shapes, symbols and figures on these screens are displayed in beautiful and often fantastic colors, with an extraordinarily plastic expression, unlike the Earth displays that I know, which in practice are only able to display flat 2-dimensional images lacking depth. These screens show everything in vivid 3-dimensional realism, like they are physically real and not just a technically generated image. Apparently, it is with these excerpts (especially the underlined parts above) from Contact Report 31, that the image of the alleged extraterrestrial instrument has been presented as an (extraterrestrial) evidence of Meier being in an ET beamship for his space journey. Here, he specifically states that all the equipment he observed whilst in the beamship are ‘strange-looking’ and ‘basically differ from all other apparatuses of the same kind and terrestrial origin that are known to me.’ This obviously implies that Meier, perhaps until 1996, had always proclaimed this image to be showing an extraterrestrial instrument on a Plejaren beamship, thus supporting Herbert Runkel’s earlier claims as reported to Luc Bürgin. Beside this device there are many different kinds of apparatuses all around the cockpit room, installed within a circular control console and on the walls. (..) All the display screens basically differ from all other apparatuses of the same kind and terrestrial origin that are known to me. Beside this device, there is also an oscillograph and many different kinds of apparatuses all around the cockpit room, installed within a circular control console and on the walls. (..) All the display screens except the oscillograph basically differ from all other apparatuses of same or similar kind of terrestrial origin that are known to me. As you can see, Meier, who until at least 1994, once claimed that all the equipment in Semjase’s beamship as strange-looking which he had never known before on Earth, later changes his story to mean that he since the beginning had already noticed the equipment as nothing other than a terrestrial oscilloscope/oscillograph. 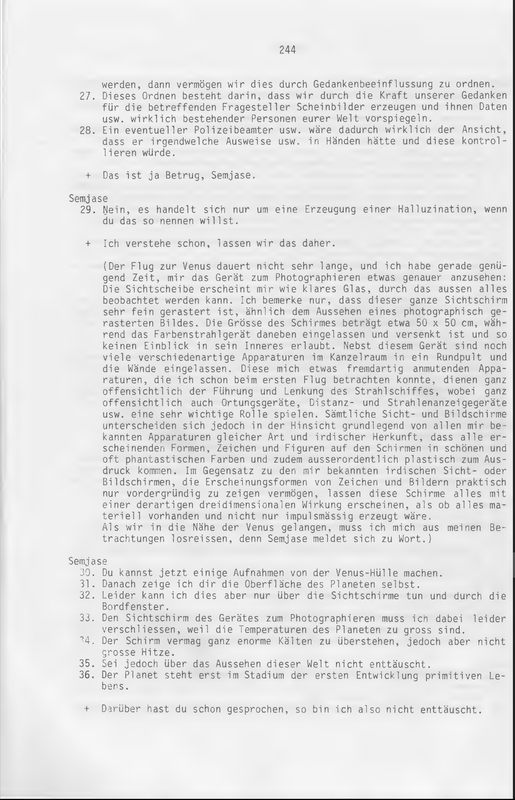 These new text alterations, only appearing in the 3rd edition contact notes (2002) right after Luc Bürgin exposed it seemingly for the first time in 1996, raises many doubts and very strongly suggests a cover up attempt by Meier. Bürgin, here seems to be unaware of the main contradiction which is that, while the rest of the pictures with rounded corners are images of objects present outside the beamship (prompting Meier to align his camera against the viewing screen having rounded corners, probably located on the beamship wall or within the console, and take photographs), the “extraterrestrial instrument” however is within the beamship which basically means that Meier straight away photographed the object without the need to look through any screen (with rounded corners). Hence, in reality no rounded corners should exist in Meier’s image. But rounded corners do indeed exist, at least on one side, “strangely coinciding” with the curvature found in old CRT monitors. This excuse is both highly suspicious and absurd. Suspicious, because Meier never mentioned before 1996 that these instruments were covered with an arched protective case (see red arrow), which in turn are surrounded by an arched dark, non-transparent, metallic material separating each instrument in the beamship. Absurd, because one can clearly see the arched boundary line of the protective-casing (see red arrow) separating the alleged extraterrestrial instrument and the surrounding area made of the arched dark, metallic material, abruptly going over the knobs/buttons/controls and partially obscuring them (ex: see green arrows). Also, how can the Plejaren operate these instruments including the one above (extraterrestrial or not) and access these knobs/buttons/controls when they are encased in a vacuum-filled protective-casing, not to mention the obscured by the dark surrounding material? The above three reasons and the several inconsistencies and contradictions that they give rise to quite clearly indicates that Meier, as has been the case with several dozen other space pictures, has most certainly also photographed a terrestrial oscilloscope (or a spectrum analyzer) from a CRT monitor. And when this was exposed by skeptics, he tried to cover up his fraudulent “extraterrestrial instrument” photo, by not only resorting to the fabrication of contact report but also by concocting an absurd tall-tale that contradicts his own claims and facts.